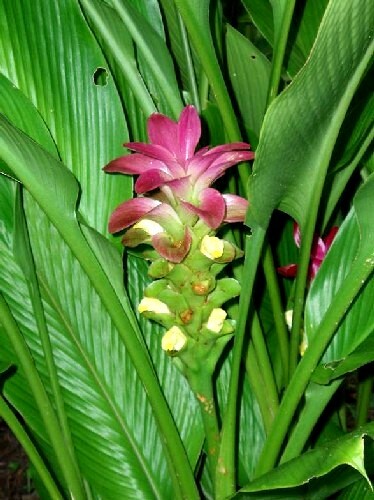 Curcuma is a genus in Zingiberaceae family native to the warm, humid environments of south and southeast Asia. 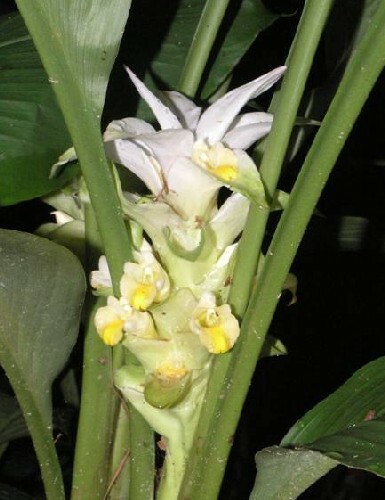 The most commercially important kind is Curcuma longa, a native of India, but widely cultivated throughout India, Ceylon, the East Indies, Fiji and Queensland for its underground stems from which, when dried and ground, the Turmeric of commerce is manufactured. 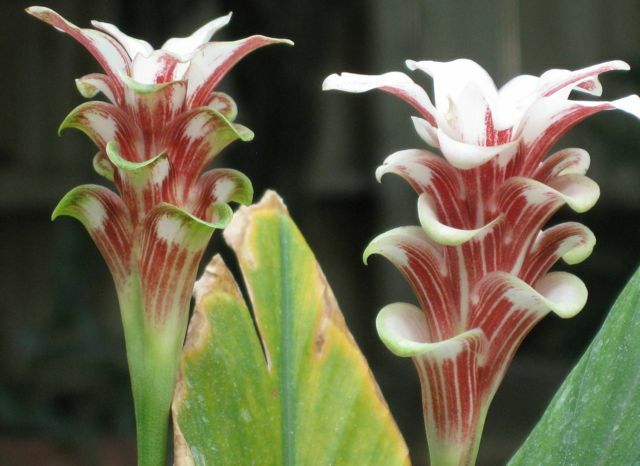 In addition to C. longa, other species are grown for their ornamental leaves and flowers. 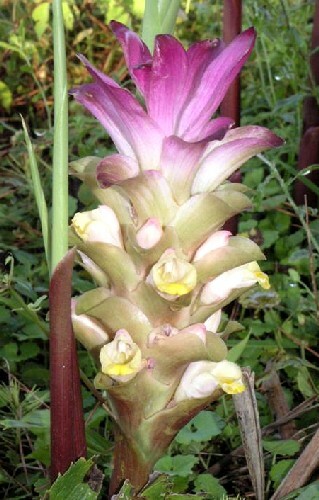 Curcuma aeruginosa has pink flowers that emerge before the red-stained foliage. 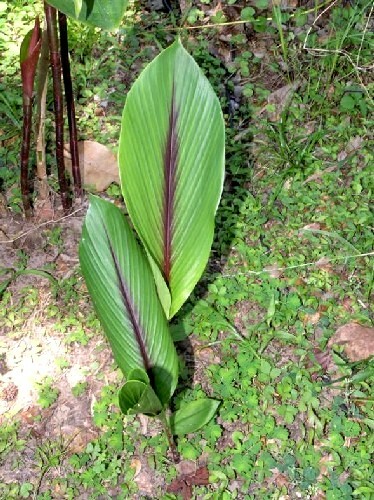 Photo taken by Alani Davis. 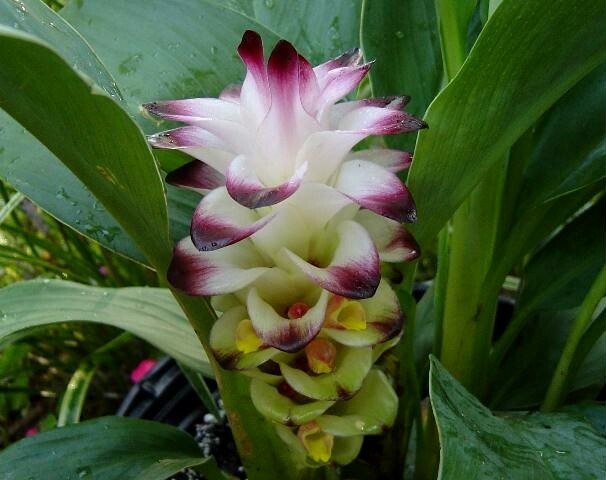 Curcuma alismatifolia This looks kind of like a ginger but is quite pretty. 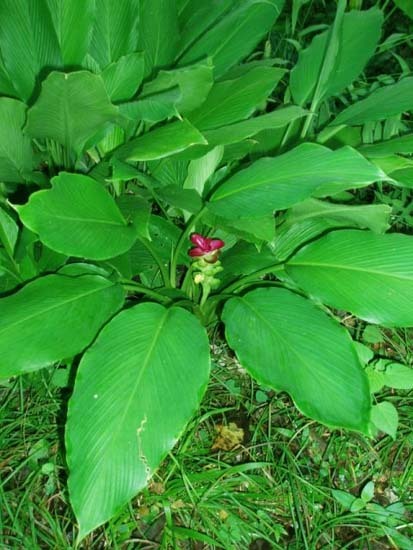 This species likes very warm weather. 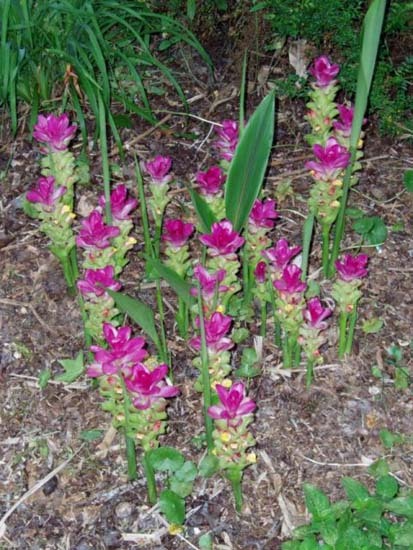 The first photo taken Sept. 2004 by Lee Poulsen. 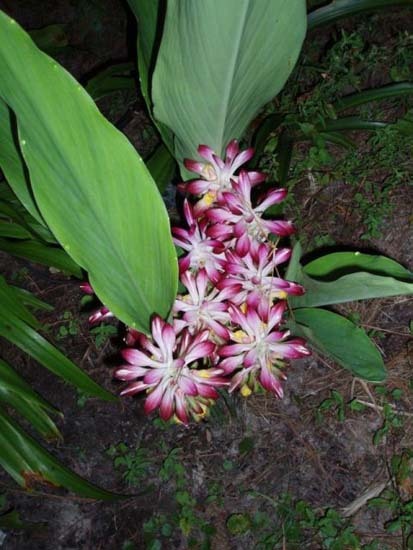 The second and third photos from Monica Swartz show the flowers. 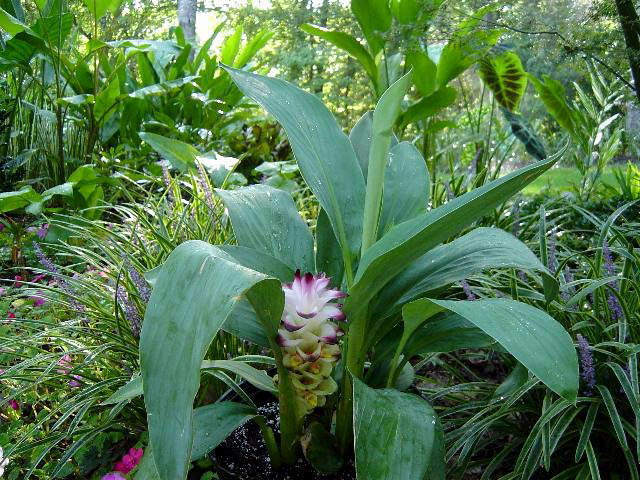 Curcuma aurantiaca has broad glossy foliage and blooms during the summer. 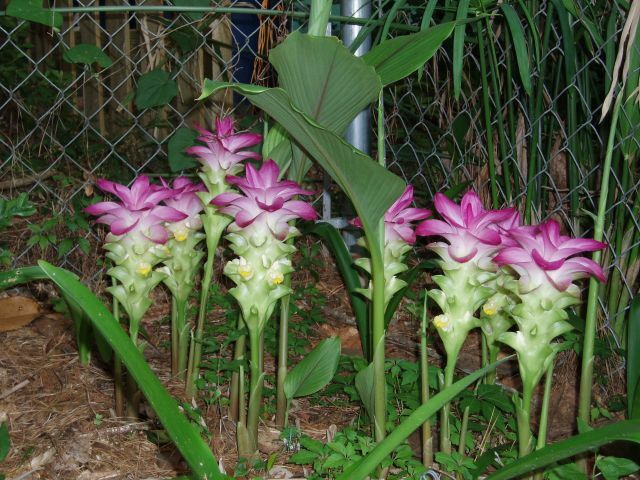 Photos taken by Alani Davis. 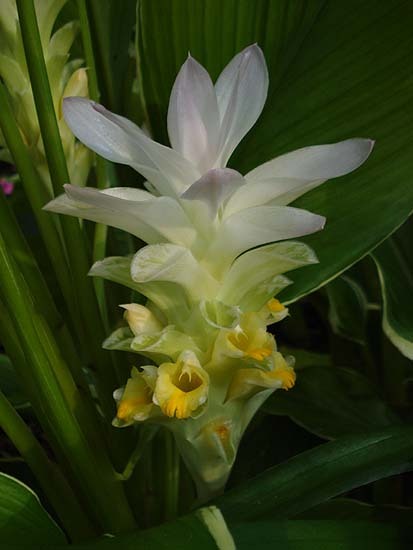 Curcuma australasica is unusual because it produces flowers with the emergence foliage during the spring and terminal as well as basal flowers with foliage during the summer through the fall. 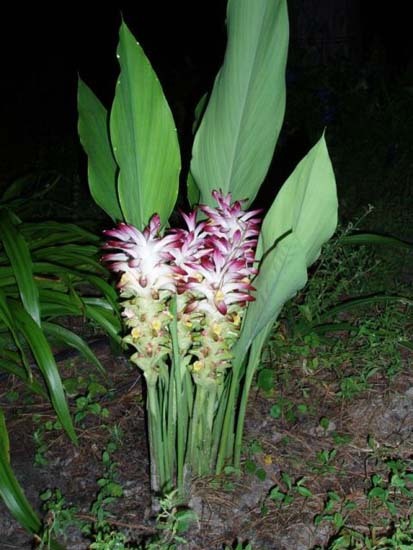 Photos taken by Alani Davis. 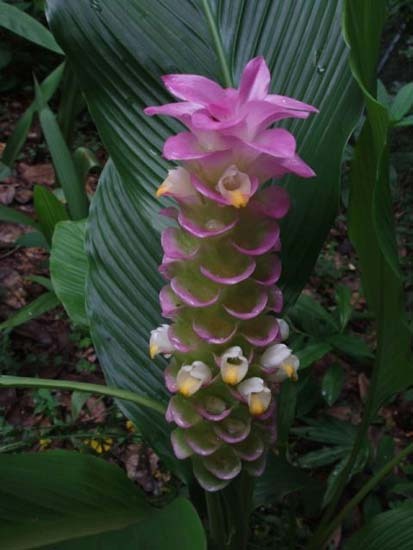 Curcuma cordata has long-stemmed, tall pink inflorescences starting in mid summer. 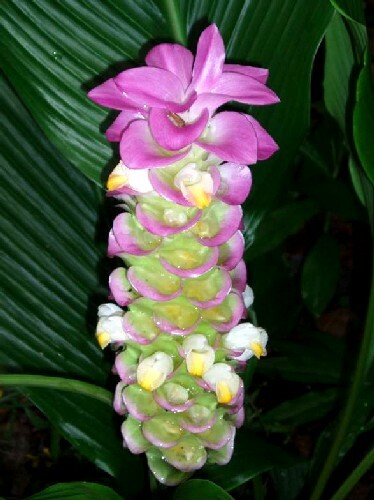 It is native to Thailand and although pink shades are most common rarer forms of pure white to purple are grown. 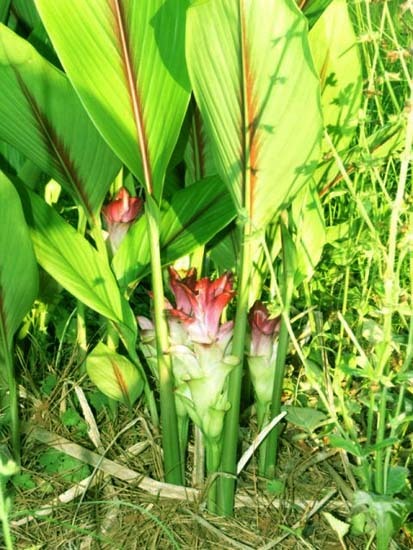 First three photos taken by Alani Davis. 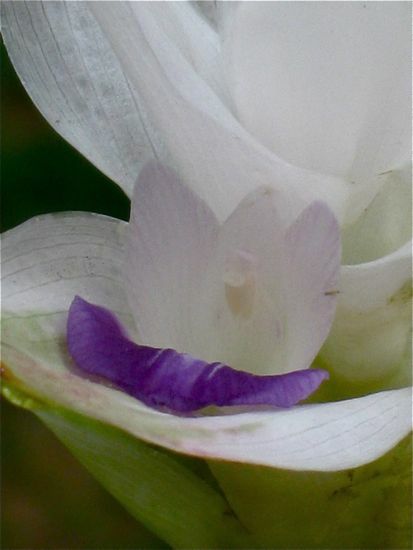 The last is a white form by Tim Chapman. 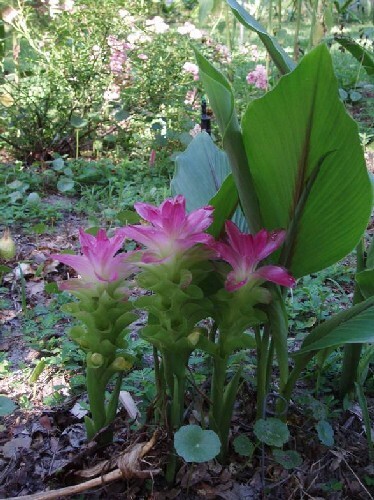 Curcuma elata has pink flowers that emerge before the foliage. 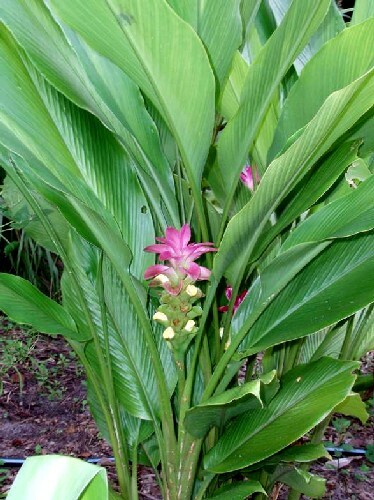 Photos taken by Alani Davis. 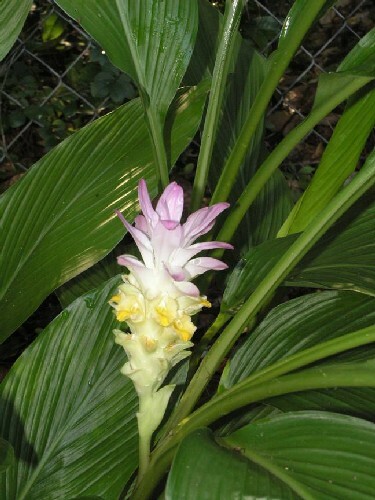 Curcuma harmandii is native to Thailand and Cambodia. 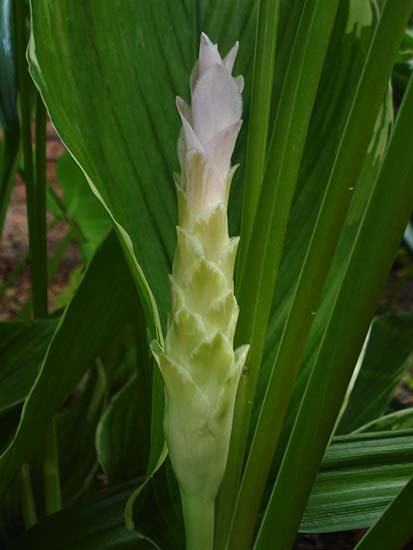 Photo taken by Monica Swartz. 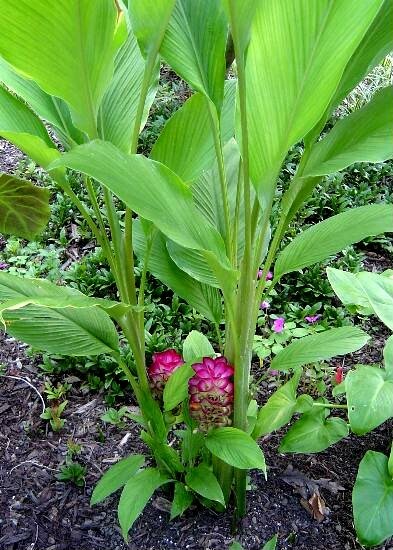 Curcuma 'Hot Lips' has hot pink flowers that emerge before the foliage & enjoys full sun in zone 8b; much more light than many Curcuma sp. Foliage to 50"/1.5 meters Photos taken by Alani Davis. 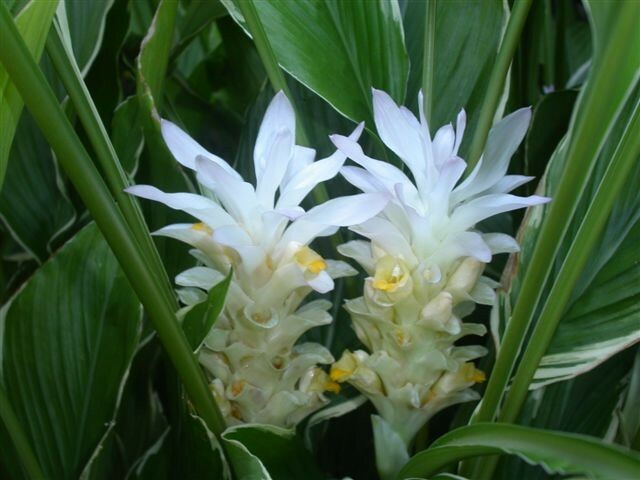 Curcuma longa is the source of Turmeric and bears white flowers during the summer. Photos taken by Alani Davis. 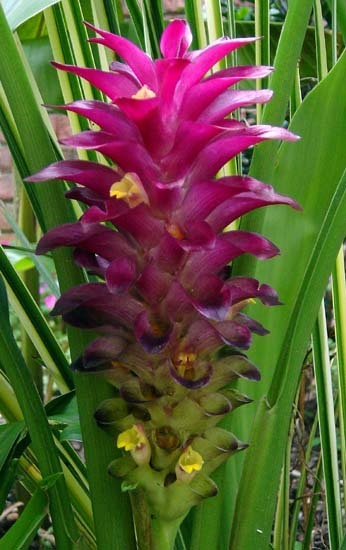 Curcuma ornata has dark pink flowers that emerge before the foliage. 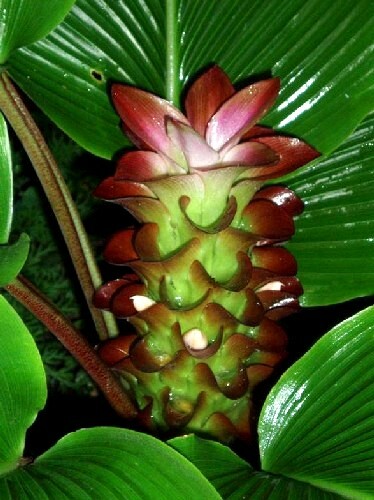 Photo taken by Alani Davis. 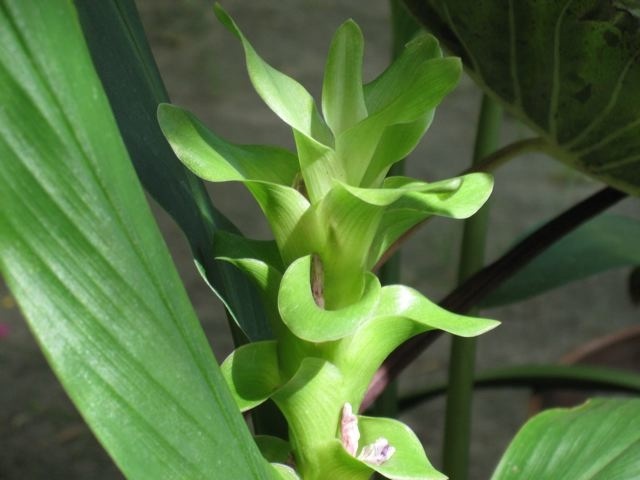 Curcuma petiolata has interesting terminal flowers in the summer. 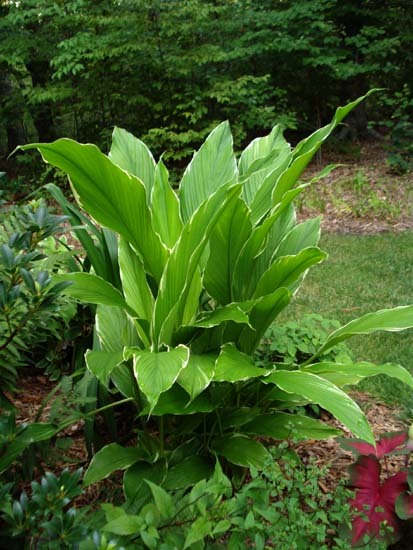 It prefers bright shade or morning sun and moist soils. 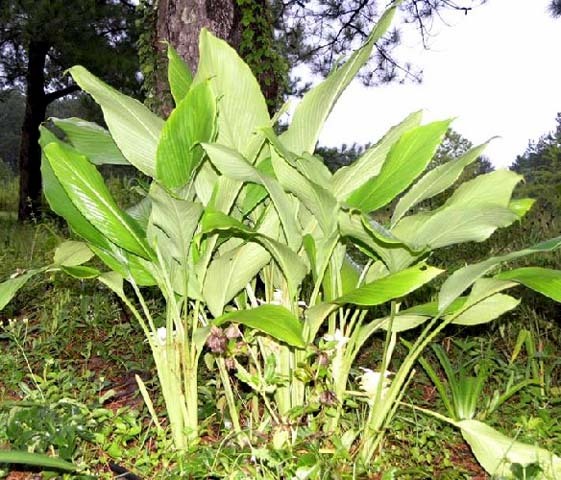 Although it can survive cold temperatures (0 °F or -17 °C) while dormant during the winter, it requires heat to grow well and is slow to break dormancy in the spring. 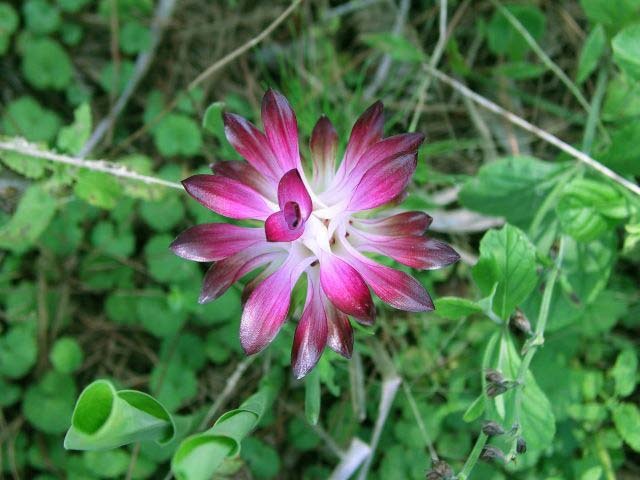 Photo taken by Alani Davis. 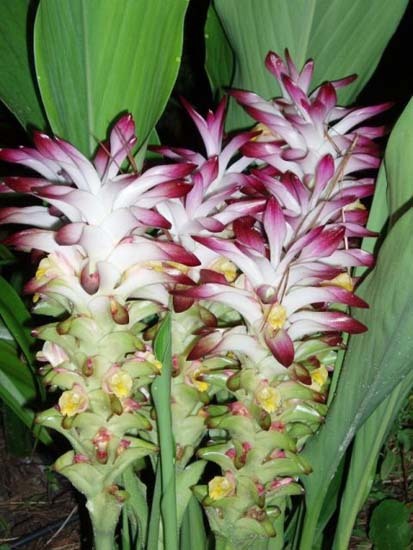 'Emperor' is a selection of C. petiolata with very attractive variegated foliage. 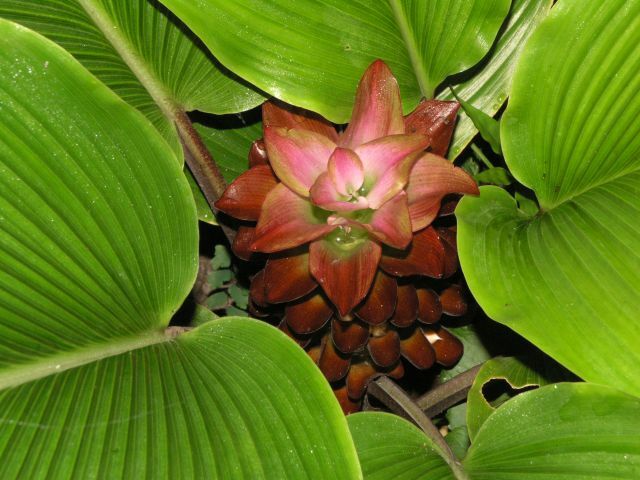 Photos taken August 2005 by Steve Burger and August 2007 by Jay Yourch. 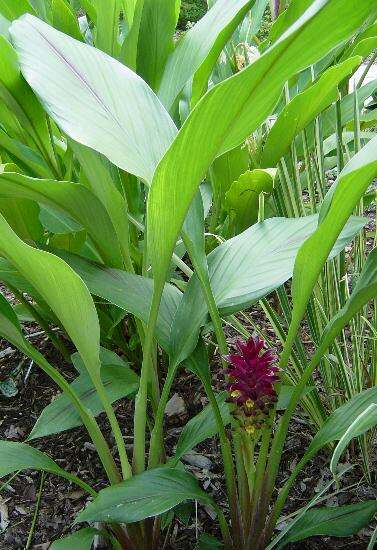 Curcuma 'Purple Gusher' is a hybrid that produces purple flowers before and with its foliage. 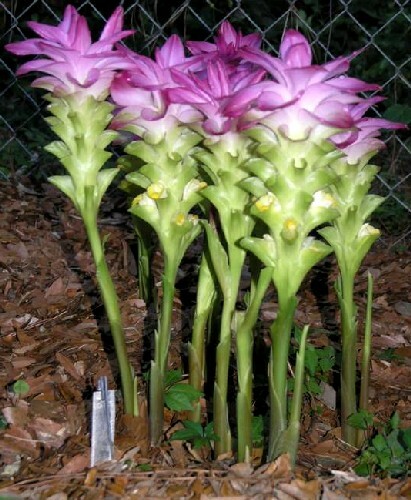 It has a very upright habit and enjoys more sun than many Curcuma. 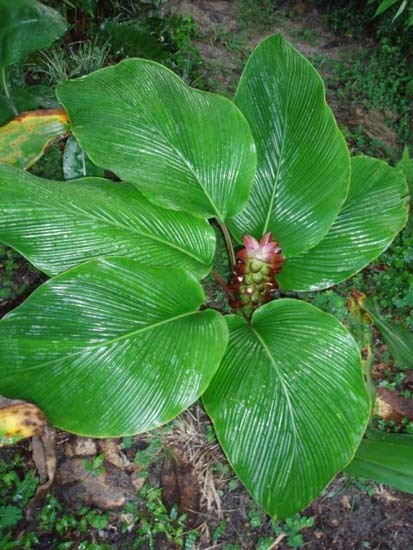 Photos taken by Alani Davis. 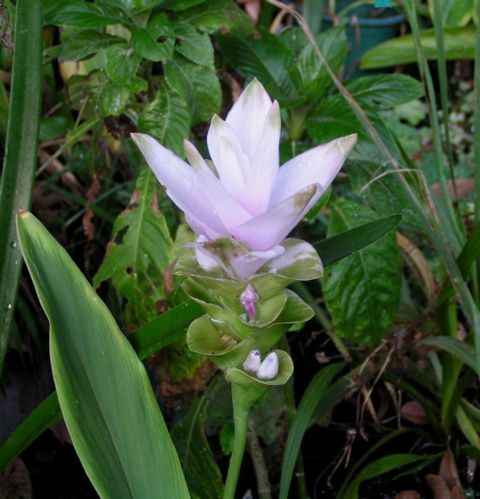 Curcuma 'Purple Prince' is a hybrid with glaucous leaves and a low-growing habit. 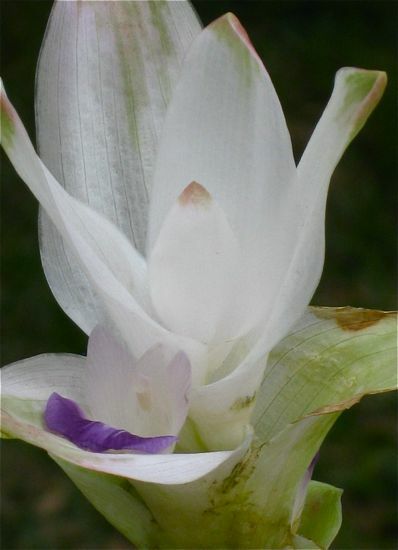 The summer flowers are white with deep purple tips. 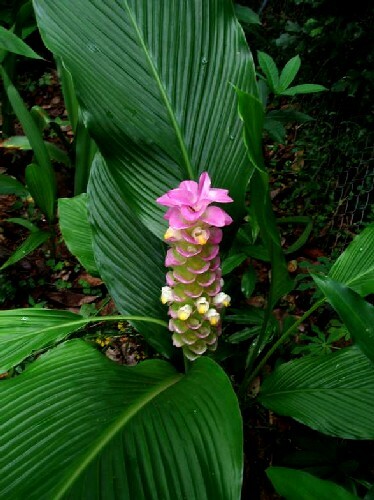 Photos taken August 2006 by Jay Yourch. 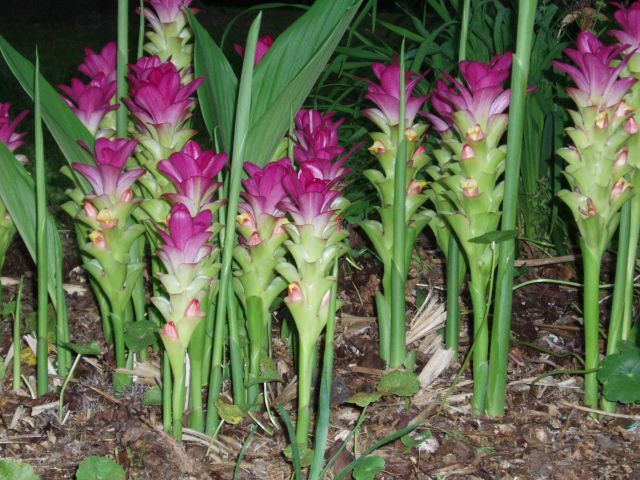 Curcuma 'Raspberry' is a hybrid with an upright habit and dark purple flowers that turn pink with age. 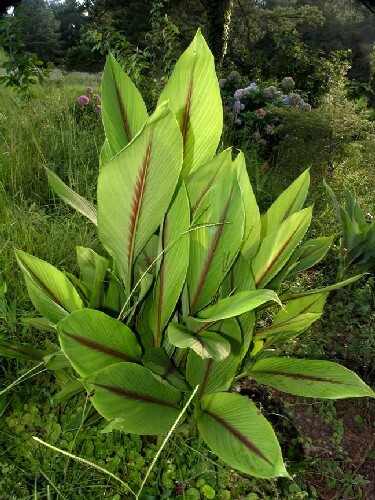 The leaves have attractive reddish stripes alongside the main vein and are very fuzzy underneath. 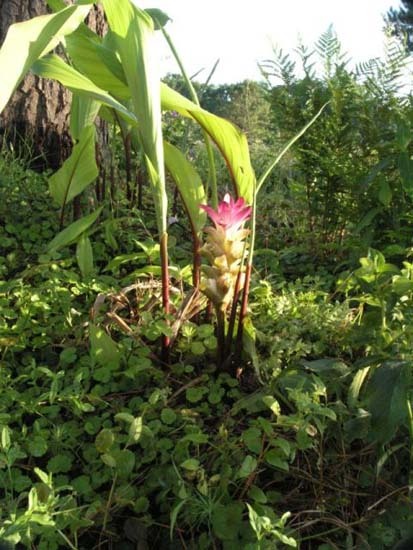 Photos taken August 2006 by Jay Yourch. 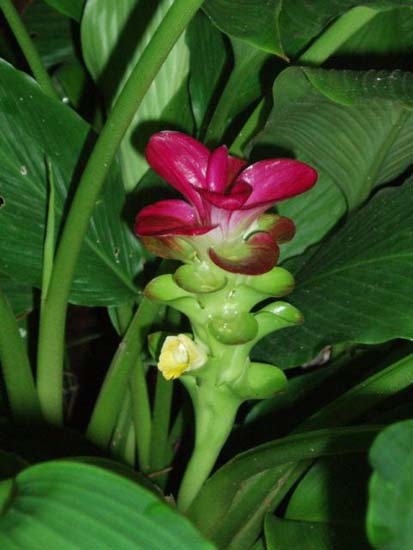 Curcuma rhabdota is native to Laos and Thailand. Photos by Monica Swartz. 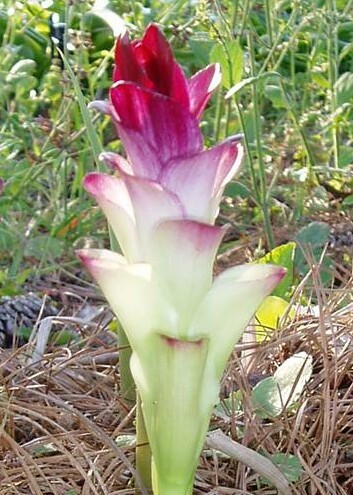 Curcuma rubescens has deep wine-purple tipped white inflorescences in the late spring which last through the emerging of the foliage. 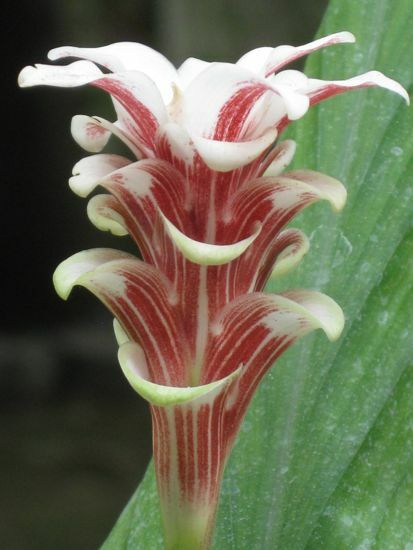 Harder to flower than others in this genus, but even without the flowers the red stems that support the leaves are very attractive. 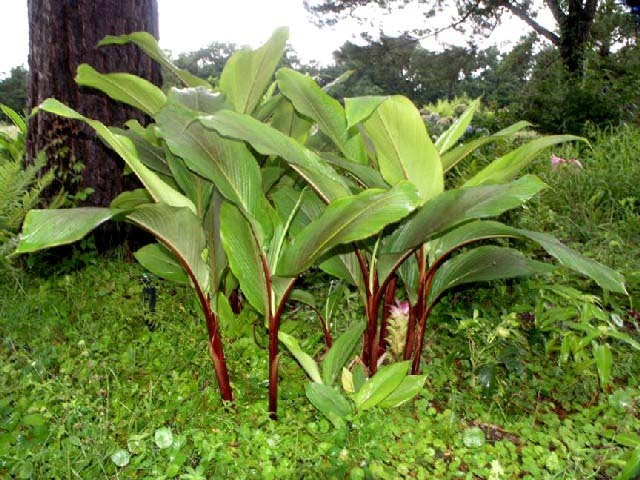 With adequate moisture it will grow in full sun and produce additional red pigment on the foliage. 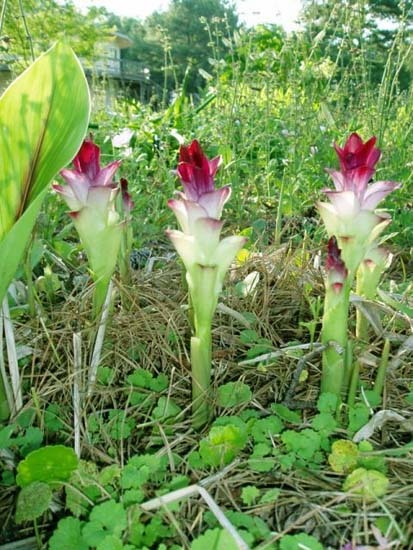 This is different from the another red-stemmed form, Curcuma 'Scarlet Fever', which is summer blooming. Photos taken by Alani Davis and Jay Yourch. 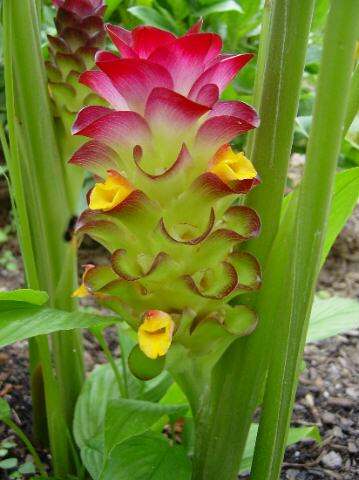 Curcuma rubrobracteata an extended rhizome species that might be viewed as running with many red inflorescences and golden yellow flowers. 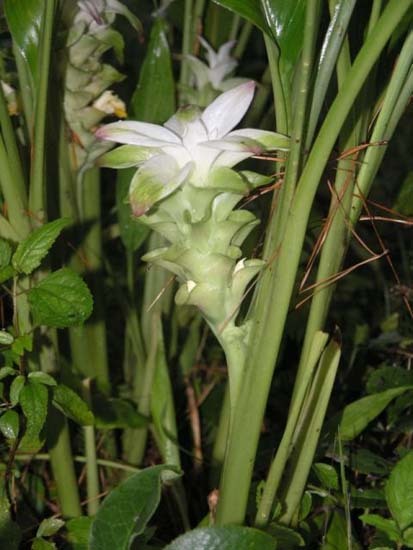 Originally this species was introduced as Curcuma flaviflora but at the time it was actually an undescribed new species. 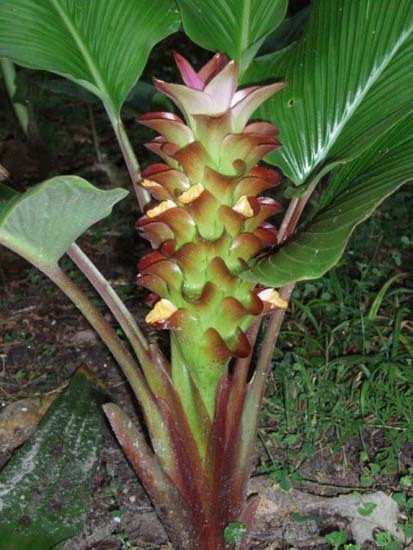 It is often sold under the names 'Fire' or 'Red Fireball'. 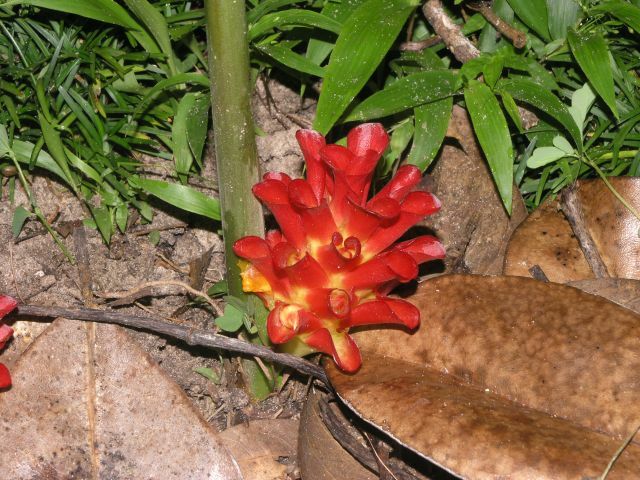 Photos taken by Alani Davis. 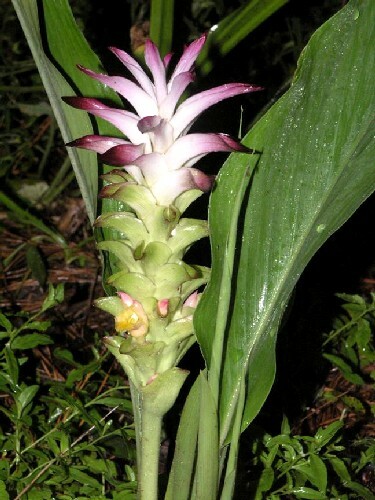 Curcuma sp. 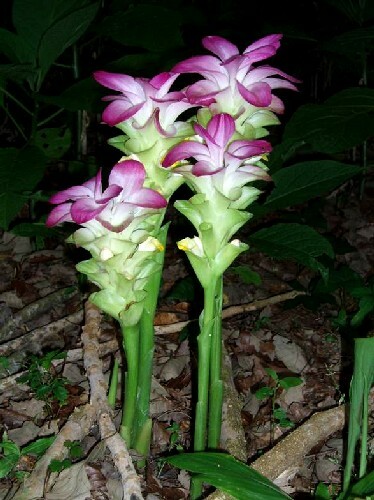 is a Thai species with an upright habit and hot pink, summer flowers. 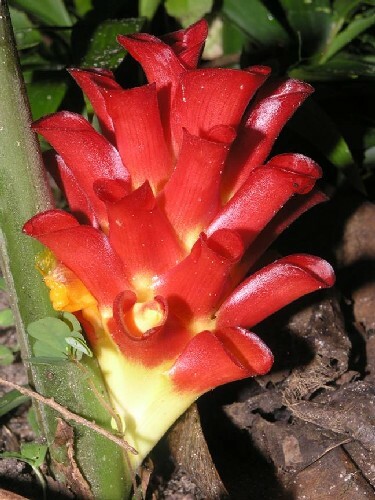 This species, yet to be identified, has been sold under the name Curcuma 'Ribbon'. 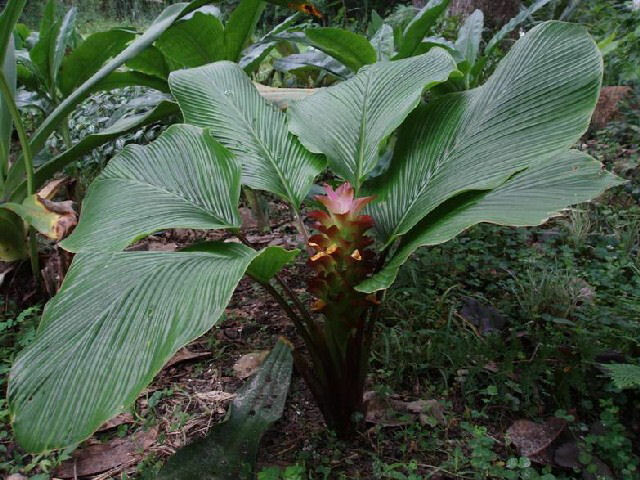 Photos taken August 2006 by Jay Yourch. 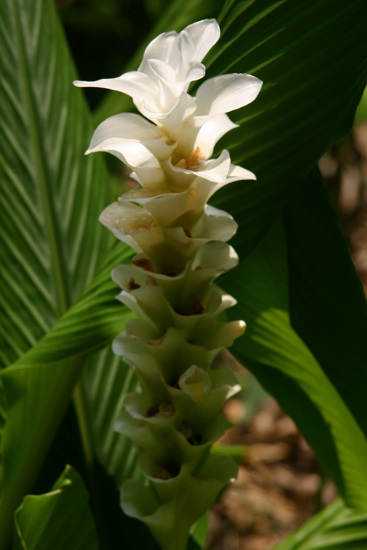 Curcuma sumatrana is a compact species getting to about 2.5 feet tall & blooming late summer through fall. Photos taken September 2006 by Alani Davis. 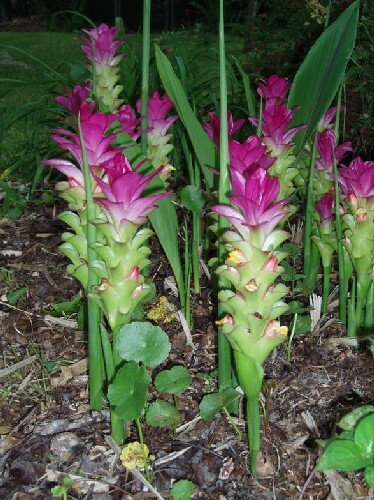 Curcuma zedoaria produces deep pink flowers and blooms at the same time its foliage emerges in the spring. 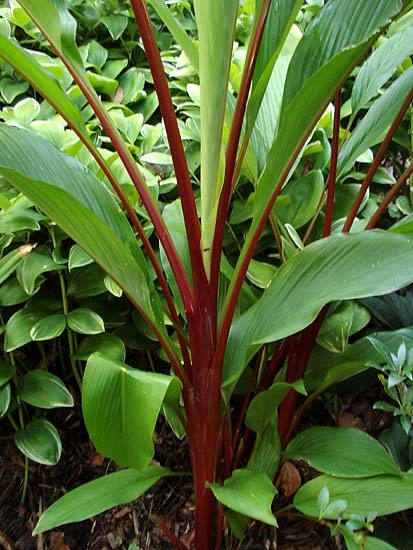 The red stained leaves make this plant very attractive even when it's not blooming. 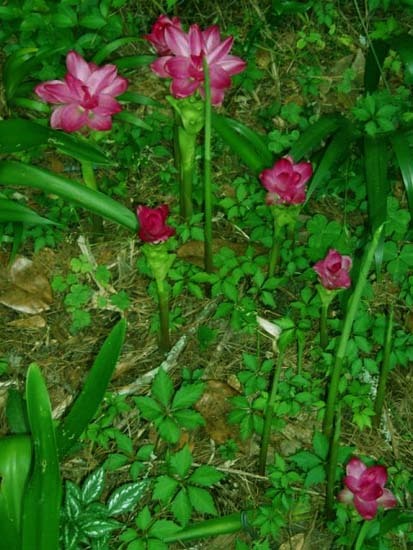 Photos taken by Alani Davis.